At least one more interest rate increase is expected before the end of the year. NEW YORK — U.S. stock indexes rose sharply Wednesday as investors welcomed remarks by Federal Reserve Chairman Jerome Powell. Powell hinted that the Fed might be willing to raise interest rates at a slower pace next year, a potential relief for investors worried about slowing economic growth. Software maker Salesforce led a rally in technology companies and health care stocks were also higher. Luxury retailer Tiffany plunged after saying tourists from China pulled back on spending in its latest quarter. KEEPING SCORE: The S&P 500 index surged 37 points, or 1.4 percent, to 2,720 as of 12:20 p.m. Eastern time. The Dow Jones Industrial Average jumped 424 points, or 1.7 percent, to 25,177. About half of that gain came shortly after noon when the text of Powell’s speech was released. The Nasdaq composite rose 116 points, or 1.6 percent, to 7,199. The Russell 2000 index of smaller-company stocks gained 22 points, or 1.5 percent, to 1,515. 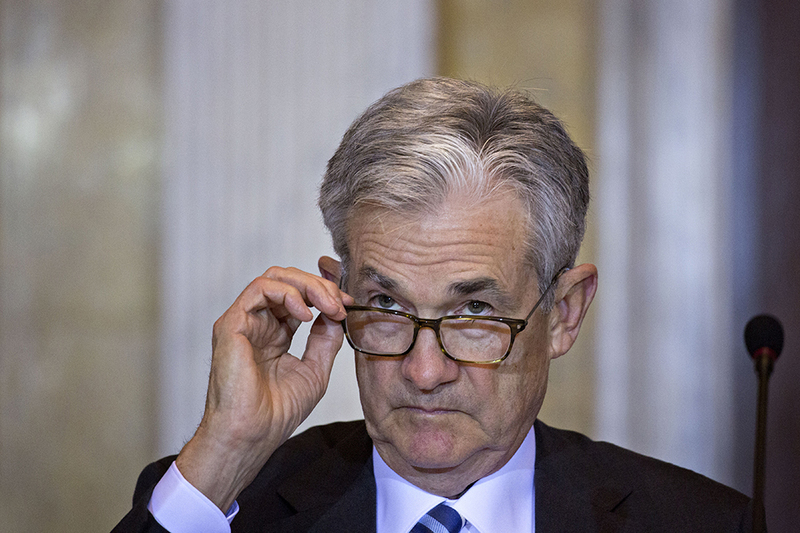 KA-POWELL: In a speech to the Economic Club of New York, Powell said the financial system and markets appear far sturdier than they did before the 2008 crisis. Recent remarks by Powell and other officials have made investors more hopeful that the Fed might raise interest rates at a slower pace next year. The Fed has been steadily raising those rates since the end of 2015 and is expected to announce another increase in December. But with economic growth in the U.S. and other regions likely to slow down next year, investors are concerned that rising interest rates will hinder the economy and the bull market. Bond prices turned higher, sending yields lower. The yield on the 10-year Treasury note fell to 3.04 percent from 3.05 percent. The yield on the 2-year note fell to 2.80 percent from 2.81 percent. The dollar fell to 113.60 yen from 113.79 yen. The euro rose to $1.1353 from $1.1296. OUT IN FORCE: Customer-management software developer Salesforce climbed 6.2 percent to $135.49 after its earnings and revenue were stronger than analysts expected. That helped pull technology companies higher. Software maker Adobe rose 5.9 percent to $245.70 and cloud computing company Citrix Systems added 2.4 percent to $111.16. Microsoft rose 2.5 percent to $109.80 and Apple picked up 2.2 percent to $178.05. DIAMOND CUT: Tiffany skidded 11.6 percent to $92.75 after it said foreign tourists, especially from China, didn’t spend as much at its stores in its latest quarter. That contributed to disappointing sales for the company. Chinese economic growth has slowed since the government clamped down on bank lending last year as part of an effort to rein in surging debt. The U.S.- China trade dispute has also contributed to the slowdown. Rival jeweler Signet lost 5.2 percent to $50.06. HOME SALES SINK AGAIN: The Commerce Department said sales of new U.S. homes plummeted 8.9 percent in October and the number of newly built, unsold homes sitting on the market climbed to the highest level since 2009. Sales of new homes have dropped 12 percent over the last year as higher mortgage rates have caused would-be buyers to back away. Sales of already-built homes have also fallen this year. The drop in home sales has made some investors nervous. They view home sales as an indicator of how much money people are willing to spend because a home is the biggest item most people will purchase. It’s also crushed homebuilder stocks. The S&P index of homebuilders is down 30 percent this year. JAMMED UP: Jam and packaged food maker J.M. Smucker fell 5.6 percent to $103.05 after it reported a smaller profit and less revenue than analysts had expected. Smucker also pared its forecasts for the full year. General Mills lost 1.7 percent to $41.73. STABILIZING? Boeing recovered a sliver of its recent losses as investigators in Indonesia discussed their probe into the crash of a Boeing 737 MAX 8. Indonesian authorities said they are still struggling to understand why the plane crashed, but added that faulty equipment and carrier Lion Air’s own safety failures had pilots fighting for control of the plane as it fell into the Java Sea on Oct. 28, killing all 189 people aboard. The MAX is Boeing’s newest plane, and questions about the crash have pulled Boeing’s stock lower. The stock rose 4 percent to $330.32 Wednesday, but it’s still down 11 percent since Nov. 8, when federal regulators gave an emergency directive telling pilots how to handle incorrect data from a sensor that may have malfunctioned during the flight. Pilots for U.S. airlines have said that they were not told about a new feature in the MAX that could pitch the nose down sharply if sensors indicate that the plane is about to stall. ENERGY: Benchmark U.S. crude turned higher and gained 0.3 percent to $51.73 a barrel in New York. Brent crude, the standard for international oil prices, rose 0.3 percent to $60.60 a barrel in London. OVERSEAS: The FTSE 100 in Britain fell 0.2 percent and Germany’s DAX lost 0.1 percent. France’s CAC 40 was little changed. Japan’s benchmark Nikkei 225 rose 1 percent and South Korea’s Kospi recovered 0.4 percent. Hong Kong’s Hang Seng added 1.3 percent.